Originally, I started using Twitter so I could get the status updates of the few friends of mine with accounts. Not long after, I set it up so that my Facebook status imported from Twitter, and I have used that mechanism, with a few rare exceptions, to update my status. I set up an account with TwitPic and used it to occasionally post links to photos uploaded from my phone. Back then, I didn't have a messaging plan (because I think that text messages are grossly overpriced--they are! ), so I would pay 30 cents for each uploaded photo. I considered it worth the money with Multimedia Messaging, and as long as I sent fewer than 17 a month, it cost less than the lowest plan. Eventually, I started uploading more and subscribing to others' tweets via SMS, and I sprung for the five dollar per month plan for 200 messages (text and multimedia combined). I have other things sending me text and multimedia messages, like Google Voice voicemail "transcriptions", certain Facebook events, and certain e-mail filters from Gmail. Anyway, most people who actually look at (and certainly most people who comment on) my uploaded phone pictures have always been doing so through Facebook. When I switched from TwitPic to Posterous for phone uploads, I was able to have the actual pictures (and videos) themselves imported directly into Facebook, whereas with TwitPic, people had to click on the link the external site to view the pictures. It occurs to me that this feature obviates the need for me to send my Posterous posts to Twitter. The exception would be someone with a smartphone who sees the pictures in (or from) their Twitter client, and wouldn't necessarily catch them on Facebook. It also would have the effect of de-cluttering my Twitter feed for SMS-only followers. Someone (like me) with a non-smart phone isn't able (or rather willing) to open links in Twitter posts, because I don't have a data plan. Posts with hyperlinks are mostly useless, unless I manually transcribe the links into my computer's browser. If I'm going to be at a computer to enjoy the posts, I might as well just subscribe via RSS, and get them through Google Reader. Currently, I don't subscribe via mobile to my Twitter followers who tweet a lot, because I'm still limited to 200 messages a month. I also don't want my phone going off five times an hour. It occurs to me that if I eliminate the Posterous auto-posts from my Twitter feed, and only--or mainly at least--send text through Twitter, others in similar situations as me will be more likely to follow me. The down side is that I've been looking forward to Twitter's upcoming "Annotations" feature. Basically, Twitter is going to let you attach metadata to your tweets if you have a rich client. They already allow location information to be added, but soon it will be opened up to anything you can think of, which will almost certainly include embedding thumbnail pictures and blog post snippets into tweets. 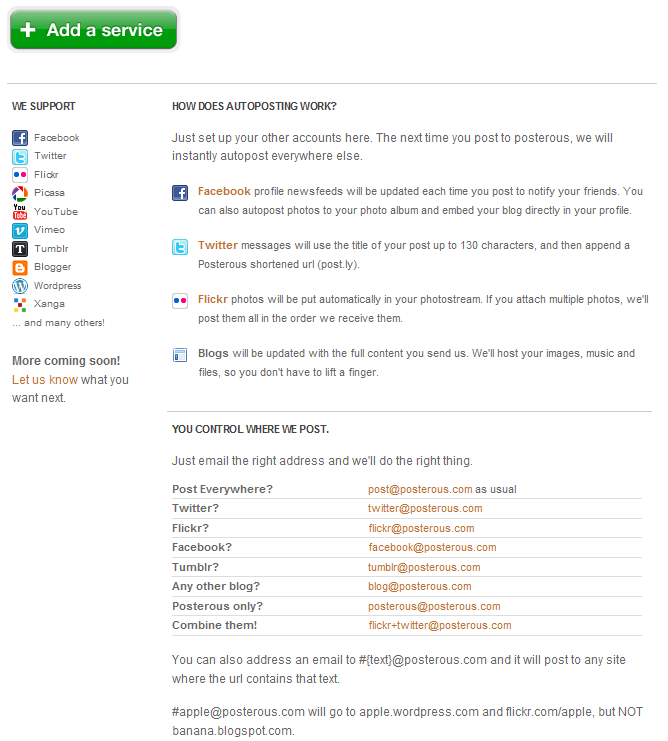 My guess is that Posterous will write support for this sort of thing into their auto-post feature. If I quit sending pictures through Twitter, I suppose I can always start sending them again when the Annotations feature arrives and matures. Right now, each picture I post to Posterous gets posted to Facebook three times: once via Twitter in my status message, once as a picture with a title in the "Posterous Photos" album, and once as a story to my wall, which includes the text of the body of the post. Eliminating the Twitter post reduces the number of posts to two. I could actually eliminate the photo method as well, but I like having the pictures inside of Facebook where they can be tagged and browsed and so forth. I think what I'll do is keep the Twitter integration intact, but normally just post to the other services. If I want a post to go to Twitter, I can send it to post@posterous.com or twitter@posterous.com in addition to my new default facebook+picasa+youtube@posterous.com (which I will need to update if/when I add more services). That way, I still have the option of posting to Twitter in extraordinary circumstances, but it won't happen very frequently. If you want to subscribe to my phone posts, please do so using the feed at my Posterous site. Today is the first anniversary of Shoshana's birth. Originally, I had intended to post a detailed birth story on my blog. I even had a couple of drafts. Eventually, I abandoned them, because I was busy (imagine that! ), and also the original post was overly-detailed, long, and mostly boring to read. So, on her first birthday, I think it's appropriate to simply relate the story without too much minute-by-minute contraction statistics and the like. One year and one day ago, I was lying in bed, peacefully asleep, when I felt Elizabeth bolt from the bed. I heard her scramble for the bedroom door and charge to the bathroom. My working model of physics did not allow for a pregnant woman to move that fast. In the midst of my formulation of a new theory of mechanics, new information was presented to my brain, in the form of not-quite-water-sounding splatting noises, as if someone had scattered viscous liquid on the bathroom floor. I glanced at the clock. It was just shy of 5:00 AM. I got out of bed, and started mopping up. Elizabeth had leaped from the bed and into the bathroom at a rather alarming rate for something as bulky as her pregnant body had become. The resulting mess was less than I had anticipated. The immediate crisis having been handled, I called Amanda, our midwife on my cell phone. She assessed the situation, and instructed us to call her back when contractions started, and get some sleep in the meantime if we could. Next we called Bethany, our doula, and Elizabeth's sister Katherine. I changed the sheets, and Elizabeth went back to bed. I took care of the chickens and ducks, got a load of laundry started, and cleared the baby's room, where the birthing tub would be set up, and finally got to bed. Twenty minutes later, contractions started. The contractions came on and off all morning. Sometimes they were clustered together, and then they would peter out. Amanda and her assistant Allison stopped by to monitor the baby's heart rate. At Amanda's advice, we took a brisk walk around the block in an attempt to get things going. Later, I installed the car seat in the car. Elizabeth's due date wasn't for another two weeks, but thankfully two weeks prior, she had had some contractions, after which we had purchased all of the remaining "must have" items on our registry. At noon, we called some more relatives to let them know what was going on. Amanda and Allison stopped by again in the afternoon. They take some vitals and some blood from Elizabeth, to monitor her for infection. Eventually that evening (about 11:00), the six of us (Elizabeth and I, Amanda, Allison, Bethany, and Sarah, Bethany's assistant) were sitting in the living room discussing the situation. The baby was not coming. It was decided that the two of us would get as much rest as possible, because we had a big day ahead of us tomorrow. Elizabeth and I went to bed sometime around midnight. When I woke up at 11:00 the next morning, Elizabeth had been up for several hours, and everyone was over again, sitting in the living room. I made myself some breakfast and joined them. They were discussing their options going forward. For whatever reason, the baby did not seem to be coming. Since Elizabeth's water was broken, the longer we waited, the more the danger of infection increased. Since Elizabeth was not being "checked" at all, this danger was significantly less than it would have been in a hospital situation, where standard procedure is to check every hour (giving germs a free ride!). It was decided that Elizabeth would take some sort of herbal "tincture" to help move things along, which was a kind of inducement, though obviously not as powerful as what would be given at a hospital. I called Elizabeth's mom, and she went to the store and dropped off the ingredients that were necessary. It was also decided that everyone would leave Elizabeth and I alone, so that we could have a peaceful, low-stress, comfortable time in which to allow labor to start. And boy did it start! At about 1:00, we called Amanda, asking if we should take the second dose of the tincture, given the strength of the contractions. Midwives have this thing where they keep you on the phone and listen to your body, not so much your words, while they get you to talk and stay on the phone. It's quite a clever trick, actually. In any case, labor had started for real, and so she was on her way, and when we hung up the phone, we called Bethany over as well. The next seven hours were full of pain and holding and pushing, and then a short break before it all happened again. They made me leave Elizabeth's side once so I could eat. I shoved half of a bowl of cereal down my throat and returned to her side. As the contractions got more intense, we moved from the bed to the birthing tub. Elizabeth was in a lot of pain for a long time. Periodically, she would get out to go to the bathroom. Amanda pulled me aside. Elizabeth was ready, physically. She had been for a while. But she had no urge to push. We needed to get her out of the tub. Elizabeth didn't want to leave the tub. Leaving the tub made it hurt more. Pain bad. Tub good. At this point, she just wanted the pain to go away. She said she wanted an epidural, which you can only get in the hospital. She agreed to leave the tub and be checked, and then go to the hospital. Amanda checked her. She wouldn't make it to the hospital, so it was at home or in the car. She was almost fully dilated; all but one part. Amanda said she could help her and it would go faster, but it would hurt. Elizabeth wanted the baby out NOW. So she helped her. And it hurt. Amanda and Allison erected a birthing stool, which is like a chair without a seat. They stuck a bowl under it, and told me what I had to do to catch the baby. Elizabeth was going to get the head out, and then slow down, and then push the rest out. I was ready. The head was coming out, but Elizabeth wasn't going to wait for the next push. She wanted it out NOW, so she kept pushing, and Allison caught Shoshana. After that, there was a lot less screaming. We moved Elizabeth back to the bed, and she held Shoshana. Amanda noticed that there was a lot of blood, and indeed there was a tear. According to Elizabeth, the pain of getting stitches is nothing compared to giving birth (I believe her). My daughter was beautiful! My wife was amazing! I was a daddy! One year. Just a year? Wow. 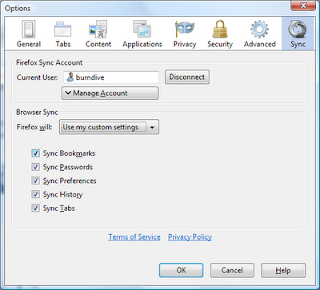 The "Mozilla Weave" extension was recently brought out of beta testing and renamed Firefox Sync. I decided to try it out, and compare it to the add-in that I currently use for browser sync, Xmarks. First, the similarities: Both Xmarks and Firefox Sync work basically the same. 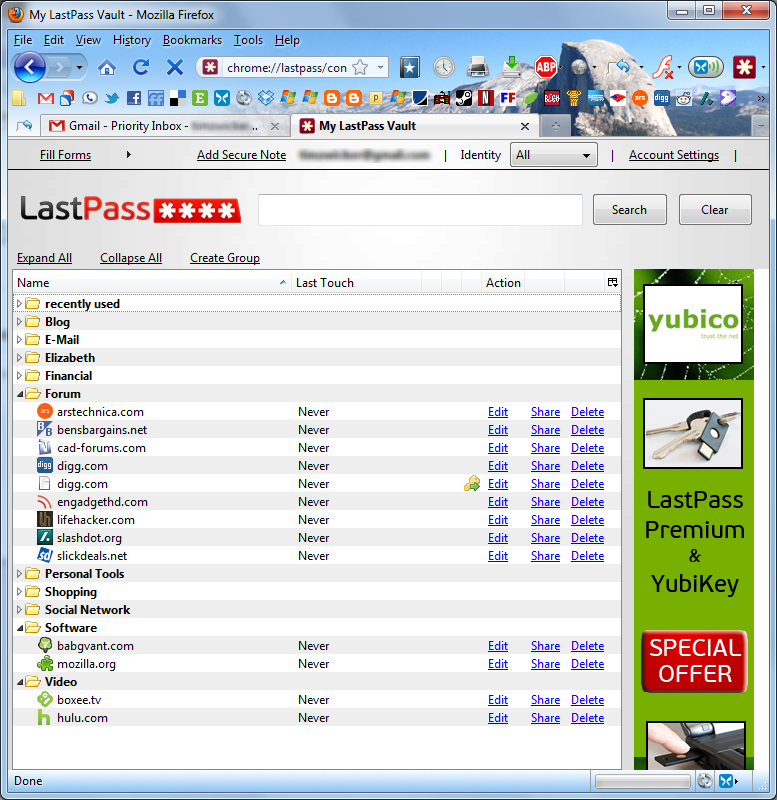 You install a browser extension, and your bookmarks, passwords, and open tabs are kept in sync across all your browser instances (each browser on each computer that you use). This is accomplished by keeping a master copy on a server. Both Xmarks and Firefox Sync will host your data, or, for advanced users, will allow you to set up and use your own server. 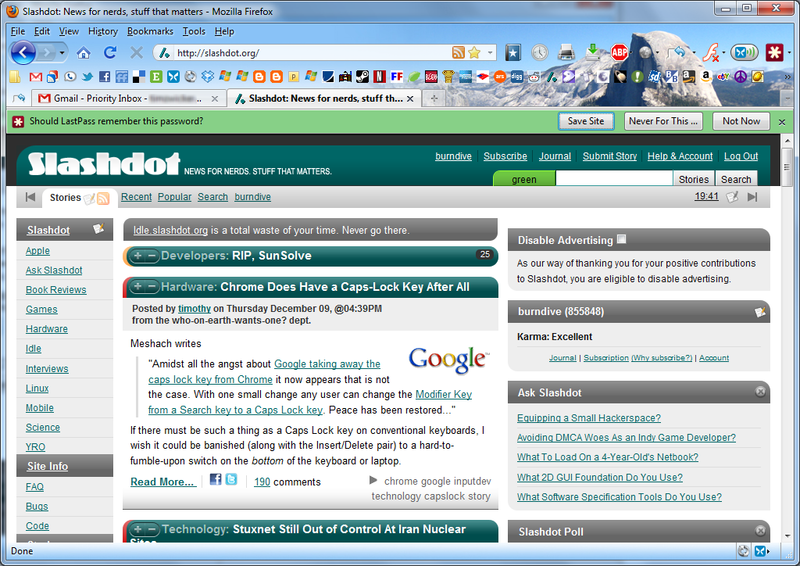 First off, Firefox Sync doesn't work with Chrome, MSIE, Safari, or Opera, at least not yet. 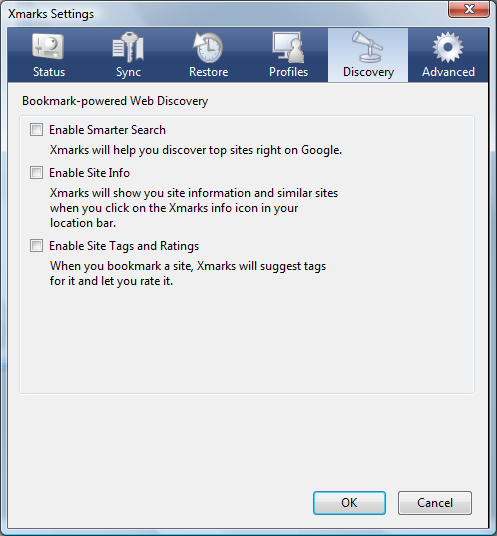 Xmarks works in pretty much any browser. I don't anticipate that this will be the case for too much longer, but it is worth mentioning at this stage. The major difference between the two services is encryption. Both services encrypt the data that you send to their servers so that no one can snoop in on the traffic as it's sent over the Internet. 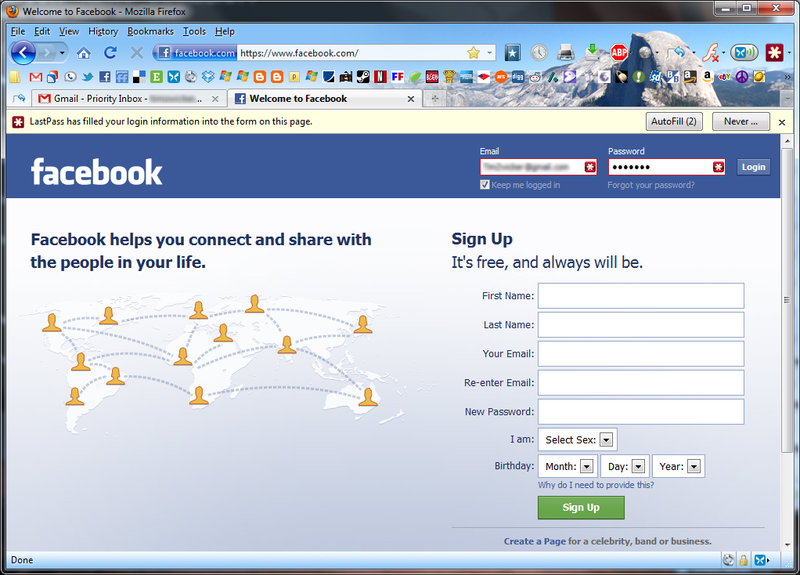 The difference is that Xmarks can read your data on their server, and Firefox Sync cannot. 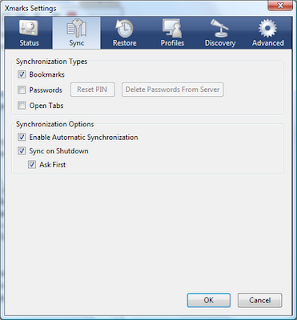 Firefox Sync encrypts your data on the client side (before it leaves the browser), and therefore its servers have no access to the data that it stores. The obvious advantage to this approach for the user is that you don't need to worry that they will sell your data, or analyze it, or do anything with it other than store it for you and allow you to retrieve it. If the servers get hacked, there won't be anything usable on them. 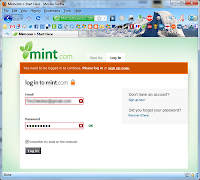 If Mozilla turns evil and wants to snoop on you, they can't: they don't have the decryption key. You do, and it was never sent to them. This is not to say that Xmarks' approach is a bad one. Yes, Xmarks can read your data. Therefore they can enable you to easily share portions of it. 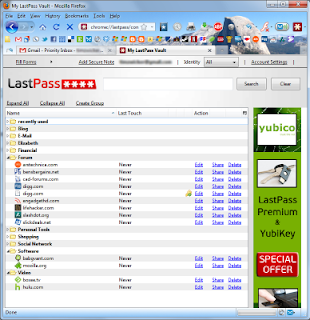 They can also provide you with easy access to your bookmarks on their website, for those instances when you don't control the browser you're using. They also keep a history of changes, so you can restore from back before you shortsightedly deleted that folder a few months (or even years) ago. 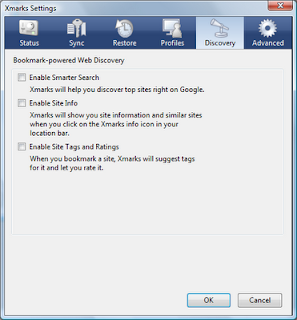 Xmarks also lets you create profiles and manage them from their website, which can contain a subset of your bookmarks, so it's possible to sync certain bookmarks with one group of browsers, but not with others. This is useful if you have a folder or two that you only need on certain computers, or if you want to have a stripped-down set of bookmarks on your media PC or netbook. The Xmarks approach isn't all good, though. They have "discovery" features that I prefer to turn off, since their business model relies on "recommending" links, their extension will alter search results pages by default in order to show you their recommendations. Still, you can turn them off, which prevents it from being a real negative in my book. So, what am I going to use going forward? Both, at least for now. As you can see from the screenshots above, I have disabled password and tab syncing with Xmarks, and only use that for bookmarks. 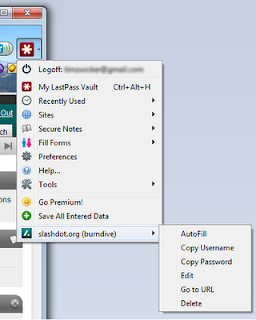 This enables me to easily share certain content, use profiles, and manage my bookmarks from the web interface. 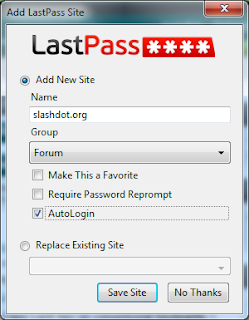 There's no reason for me to have my passwords on anyone else's server in an accessible form, or my currently open tabs, for that matter, so I'm using Firefox Sync for that. Firefox Sync is also set up to sync my History, Preferences, and Settings, which is something that Xmarks can't do. I'm syncing my bookmarks to Xmarks on my Linux box only (which is always on, and usually has Firefox open), that way it will keep up-to-date with changes that happen over Firefox Sync which is enabled and syncing everything on all of my Firefox browsers. I'm currently not doing much with Xmarks profiles, but if I want to use them in the future, I can have Xmarks handle bookmarks sync on the browsers with non-default profiles. I use Firefox by default, but I also occasionally use other browsers, so I have Xmarks set up on non-Mozilla browsers as well. Today's sermon brought to my mind an old hymn. The sermon was on Colossians 1:12-22; 2:9-15. It was about how complete our salvation is: how perfect the redeemer and act of redemption. That even though we had by our own decisions and actions joined ourselves to the kingdom of darkness as Satan's rightful property, in the transaction and conquest of the cross, we have been made holy, and transferred into the kingdom of light, where we are sons and heirs of God with Christ. Even though we were once guilty, and judgements against us that kept us from the presence of God, instead of being cashed in at the price of our soul in hell forever, those judgements were taken and nailed to the cross, and are no longer valid. Their legal status is null and void, and we are deemed to be as holy as Jesus Christ. Even though we were hostile to God, and had broken our relationship with him, Christ has made peace, and restored that relationship, so that there is no longer any offense that God can hold against us, and we can freely enjoy his unobstructed love and friendship. Though we were once dominated by a powerful enemy, Christ has rendered our enemies powerless against us. He has disarmed, completely defeated, and triumphed over them. His victory is so complete that there is no way that we can fall back into their hands. We are 100% secure from spiritual loss. Because we know these things, we don't need to believe the lies that say otherwise. We are free to live the life of Christ! The part of it that was most precious to me this morning is that I am completely reconciled to God in my relationship with him: that I am dear to him, and nothing can stand in the way of how precious I am to him as his child. He longs for me to enjoy him. And tells me, "Thou art mine". ~ A. Ka­ther­ine Hank­ey, 1866. I just finished describing a script I created in order to have a thumbnail image in my Blogger sidebar widget whenever I send a post to Posterous from my phone. If you are inclined (and have any idea what I'm talking about) please head over there and check it out. Okay, über-nerd content is over! Sorry to scare you like that. From here on out, normal levels of nerdiness only. I like to post pictures from my phone to the Internet. To accomplish this, I have been using TwitPic, which takes the MMS message, posts the picture on the web, and then takes the subject and posts that on Twitter along with a link to the picture page. It's a well-oiled machine, and it works, but it is not ideal. For one thing, TwitPic has yet to implement OAuth with Twitter, which means that they require you give them your Twitter password in order to use the service. This fact alone had me looking for alternatives, and I had been considering switching to img.ly. Recently, a friend of mine I follow on Twitter started posting videos using TwitVid, and I thought that was pretty cool, so I decided to check it out. They use OAuth (at least, it's available--they also let you just give them your password), so that was nice. But I decided to take a look around at other similar services to see what they had to offer. In my experiment with TwitVid, the video I uploaded never made it to Twitter because it was still processing the video several hours later. I canceled the account. In looking around, I found that Posterous came highly recommended for phone content, and so I did some looking. Normally, I wouldn't have thought of Posterous as the right tool for the job, most of what I see on Posterous is barrages of information that people share, mostly re-posts of others' material with commentary (similar to Google Reader, but much more like Tumblr). However, I had seen a good example of original content on Posterous, and I liked the format. So, after looking into Posterous' features, I created an account and started using it. Here's what I like about Posterous. It supports OAuth, so I don't ever have give them your passwords for other services. I can post by e-mail, or, more specific to my case, MMS from my phone. Like TwitPic, it will post pictures to Twitter. Like TwitVid, it will post video to Twitter. Unlike both those services, it will post pretty much anything to pretty much anywhere and everywhere I choose. Whereas before, people on Facebook had to click on the TwitPic link on my imported status update to see the picture, now, the actual picture/video is posted to Facebook (and YouTube, in the case of video). It supports pretty much anything you throw at it: text, images, video, audio. It will store, organize, publish, and push my content out to other services in the way that I specify. It supports a bunch of other services that I'm not using yet, but would be simple to set up if I started using them. If I want, I can restrict a post to show up on only the services I specify for that particular message--on the spot, over MMS. I like it, and I would recommend it. 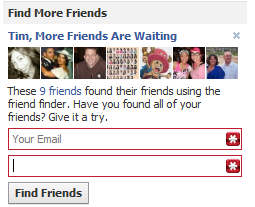 Friend requests from people who, though we are in the same social circle, I have never interacted with. Invitations to waste time and/or clutter my profile with some application. This includes "interacting" with me from applications I have not installed. Event invitations that unnecessarily last for weeks. This screws up my Google Calendar, which imports my Facebook events. Couples that share a single account. This one bugs me on a much deeper level than the others. Now go, and sin no more. A while ago, I wrote a post in which I create a list of software to install on a new Windows box. I did this mostly for my own reference, but it might be useful to others. The first item on my list is Firefox, but (until now) I didn't include any extensions. 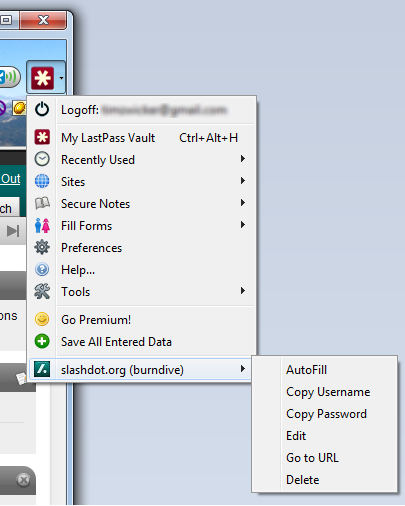 Firefox is all about customizations, and extensions are the most powerful way to customize it. But who wants to go through the trouble of sorting through the thousands of extensions to find the useful ones? Well, it's more a matter of keeping your ear to the ground and trying out the ones that sound good and/or come recommended. After years of research, I've created a collection of extensions! I didn't write any of them, I just bunched them together because they were all useful to me. You can choose to install them individually, or as a group. I hope you find them as useful as I have.